Desserts are my special treats. 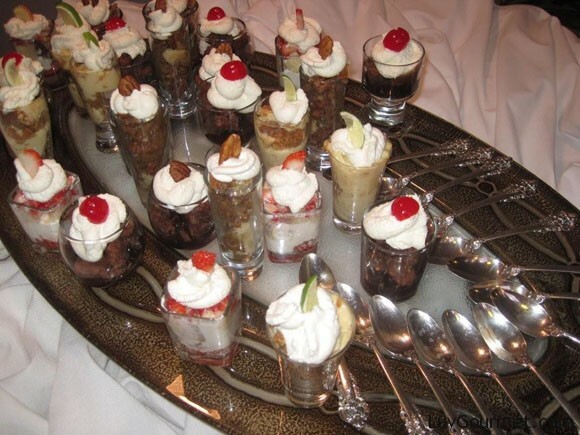 When I entertain, I like to serve a variety of desserts to give my guests choices. Wish I could claim the concept of offering “mini” dessert portions in whisky jiggers, which are so cute, and the perfect size…..but no cigar. So many people are either health or weight conscience; but when you offer small versions of sweet confections, in an appetizing and visually tempting way, who can resist one or even two? How would you like to offer chocolate mousse, Key Lime pie, strawberry short cake and pecan pie and brownies all at one meal? Well look at the pictures and lick your lips because here are a few of the recipes to make it happen and ensure happy faces. In a medium bowl, stir together the graham cracker crumbs, melted butter and cinnamon. Evenly press the crumbs into a nine inch Pyrex glass plate. Bake for 12 minutes or until firm. Remove the crust from the oven and reduce heat to 325 degrees. In a large bowl whisk the eggs with the Cream of Tartar. Stir in the condensed milk and whisk in the Key Lime juice. Pour the filling into the crust and bake for 15 minutes (no longer).Let the pie cool. Refrigerate and serve with sweetened whipped cream. Using an electric mixer, whip all ingredients together until fluffy. Begin by separating eggs. In a double boiler melt chocolate with softened butter and fold in egg yolks one at a time. Add coffee and liquor. In separate bowls whip egg whites with sugar into hard peaks and whip heavy cream separately. Fold both into chocolate mixture. 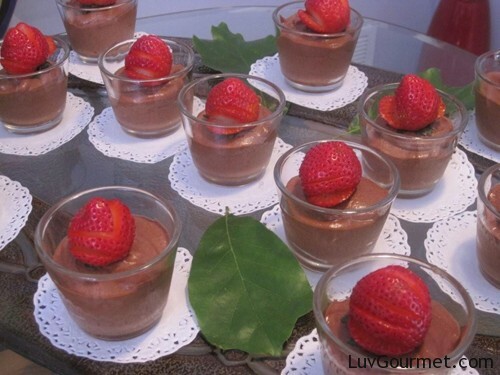 Pour the mousse into small bowls or wine glasses for individual service. For decoration, pipe whipped cream on top or add a slice of strawberry. Mix all the ingredients together with one C chopped pecans. Pour into an uncooked pie crust and cover the entire top with second cup of pecans. Bake at 375 degrees for 30 to 35 minutes. Filling will rise slightly. Whip cream until it stand in peaks. These look lovely and refreshing!